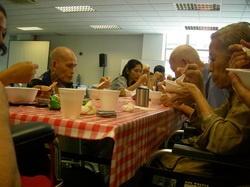 2nd June 2012 marks the inception of this event for the elderly living in our neighbourhood. Held in 3 locations – Choa Chu Kang, Sembawang and Tampines – the goal is to provide a fun-filled afternoon decked with nostalgic games and food stalls plus great entertainment, free giveaways and goody bag. Strictly for the needy elderly, guests will be pick-up from all the housing estates and brought to the 3 locations. An event that dates back to 1989, its main goal is to honour the senior citizens living in Singapore, regardless of race, gender or religion. It is to remember our nation-builders – those who helped to build Singapore to what it is today and are still living among us. In appreciating them, we provide great entertainment, games, fun, lucky draws, sumptuous food and a goodie bag for everyone who attends. Over the years, Care & Share have been held in several locations where the needy elderly were pick-up by chartered buses from the housing estates all over Singapore. The 20th Anniversary of Care & Share was celebrated with a big bang at the Marina Bay Floating Platform in October 2009. A bi-yearly combined EAC event, with lots of food, fun, fellowship, entertainment and take home prizes. A twice-a-year event where residents from our four Elderly Activity Centres (Tampines, Hougang, Toa Payoh and Choa Chu Kang) gather in one location and celebrate life with lots of fun-filled activities, food, warm fellowship and takeaways. After the tsunami and earthquake hit the Noth East Region of Japan in March 2011, 12 teams of volunteers totalling 85 people took time off from their busy schedule and head for Japan between April and December 2011. Spending a week there, they lend a hand to clear debris, teardown damaged walls and ceiling boards, clean walls and floors, sanitized ground with effective microorganism pellets, distribute food and clothing and bicycles, and a listening ear to those grieving the loss of their loved ones. To the volunteers, it was a life-changing experience. Hope volunteers brought hope to the hopeless.